Shares of Hawaiian Airlines and Volaris could both continue rallying in 2016. 2015 hasn't been as kind to airline investors as the previous two years, with one popular index of airline stocks recording a double-digit drop. However, Hawaiian Holdings (NASDAQ:HA) and Volaris (NYSE:VLRS) have been two big exceptions to the industry's overall performance. Hawaiian Holdings stock has gained nearly 50% year-to-date; Volaris stock has almost doubled. Hawaiian Airlines and Volaris 2015 Stock Performance. Data by YCharts. 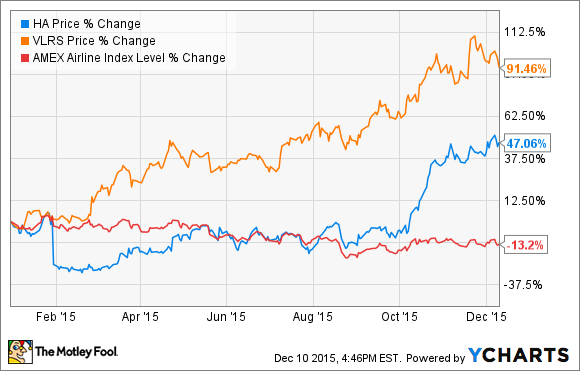 Despite these stellar performances, both stocks could continue to march higher in 2016. In fact, just this month, both Hawaiian and Volaris have provided new information that bodes well for their earnings growth prospects next year. Hawaiian Airlines stock has surged since the beginning of October, after the company increased its third-quarter earnings guidance. On the third-quarter earnings call, Hawaiian's management provided a bullish revenue outlook for 2016. The strong dollar and falling fuel surcharges will still weigh on revenue growth next year, but they will have a much smaller impact than in 2015. Meanwhile, West Coast-Hawaii industry capacity growth is slowing. If that trend holds throughout 2016, Hawaiian should be able to produce solid results there. Finally, the company's own capacity adjustments in the inter-island market have driven steady unit revenue improvements within Hawaii in recent months. Meanwhile, Hawaiian Airlines is on pace to get another big year-over-year benefit from lower fuel costs. It will pay an average of about $2 per gallon in 2015. At its investor day earlier this month, the company projected that its average fuel cost will be $1.65 to $1.75 in 2016, providing savings of $70 million or more. Hawaiian Airlines will save even more money on fuel in 2016. Image source: The Motley Fool. Finally, a series of transactions this year will dramatically reduce Hawaiian's diluted share count for 2016. In 2015, the company's full-year diluted share count will be above 61 million. But CFO Shannon Okinaka projected at Hawaiian's Investor Day that the diluted share count will be just 53 million to 55 million shares in 2016. This 10% to 13% reduction in the share count will drive earnings per share higher. Even if net income is unchanged next year, Hawaiian would produce double-digit EPS growth. With growth scheduled to ramp up beyond 2017, Hawaiian Holdings stock could produce more solid gains in 2016. Volaris was barely profitable in 2014, but its results have improved dramatically this year, due to lower fuel prices and a stronger demand environment in Mexico. Through the first nine months of 2015, Volaris' operating margin surged by 15.8 percentage points year over year: from -2.2% to 13.6%. Volaris has become increasingly bullish on demand over the course of 2015. As a result, it has significantly increased aircraft utilization in the second half of the year. In addition to boosting revenue, this is driving unit costs even lower. (Falling fuel costs have helped, too, of course.) In the third quarter, Volaris' dollar-denominated unit costs decreased by a stunning 27% year over year. In fact, Volaris' management is so confident about the future that it has been out all year long signing deals to grow its fleet. Volaris ended 2014 with 50 airplanes. As of March, it planned to increase its fleet to 55 planes by the end of 2015 and 59 planes by the end of 2016. Volaris is expanding its aircraft fleet rapidly. Image source: The Motley Fool. During the next six months, Volaris extended three expiring A319 leases and ordered several new aircraft for delivery in 2016. As a result, by September, it expected to end 2015 with 56 planes and end 2016 with 65 planes. Earlier this month, Volaris revealed that it had increased its growth plan yet again. It now plans to end next year with 68 planes. Volaris' growth will help it further reduce its unit costs. Nearly all of the capacity added to its fleet plan this year comes from 220-seat Airbus A321s, which are significantly cheaper to operate on a per-seat basis than the A319s and A320s that make up the bulk of its current fleet. Volaris now plans to take delivery of eight new A321s in 2016. Volaris is on pace to increase capacity by about 20% year over year in 2015. These recent fleet plan changes mean that it will likely continue growing at roughly that rate in 2016 and 2017. Volaris' expansion plans should drive continued unit-cost improvements in the next year or two along with accelerating revenue growth. That's a recipe for strong EPS growth, and it could drive Volaris stock even higher in 2016.